An unheralded ESRB rating has given credence to rumors that the original Crysis is coming to the Xbox 360, and maybe the PlayStation 3 too. The rumor mill started turning last week, when the South Korean Game Rating Board posted a rating for what appeared to be an Xbox 360 version of the original Crysis, which came out for the PC back in 2007. I say "appeared to" because the Google translation was pretty awful, but while it's possible that a mangled translation of a Korean game rating could lead to confusion, it's hard to say the same about the ESRB, which has just put out a similar rating of its own. 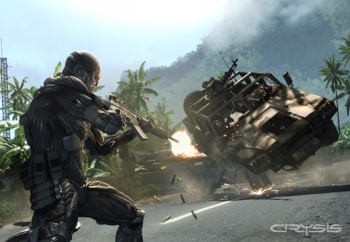 The ESRB now lists Crysis for the Xbox 360 and the PlayStation 3 as well, although there's nothing else said about the game that we didn't already know: it's published by Electronic Arts and rated M for violence and naughty language. Crytek has remained steadfastly silent on the matter while EA hit VG247 with a standard "no comment" comment. It's not professional to be presumptuous, so let's get to it. If the wall of stony silence is an effective admission that Crysis is on the way to consoles, the obvious question, as noted in the original rumor report, is how? Back in 2007, Crytek said that current-gen consoles didn't have the sand to run the game at the level of quality the studio wanted; the safe bet at this point that the game will be powered by the CryEngine 3, which drove the recent Crysis 2 that did make it to consoles. But whether it will offer the visual splendor of the original PC release is a different question altogether and, I would think, somewhat less likely.